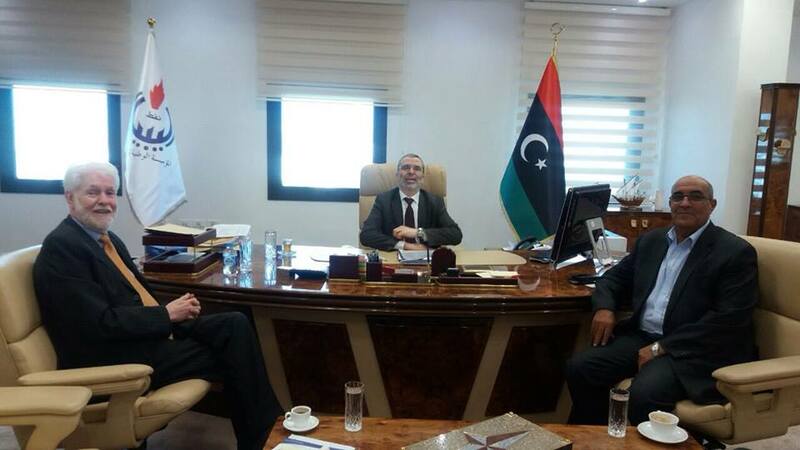 NOC chairman Sanalla met with the head of the Libyan Businessmen Council, Abdalla Fellah (left)(Photo: LBC). Abdalla Fellah, the chairman of the Libyan Businessmen Council (LBC), the only business council (as opposed to NGOs) recognized under current Libyan law, met with the chairman of the National Oil Corporation (NOC), Mustafa Sanalla on Monday. Fellah thanked Sanalla for his support of the business conference in Benghazi of 19-20 October 2016 and called for the NOC to be kept unified and away from Libya’s on-going political tug-of-war. He urged for the reopening of all closed oilfields, ports and valves so as to return oil production to 2012 levels (just over a million barrels per day). Fellah offered the full support of the LBC in helping the NOC in developing and maintaining its damaged infrastructure and fields. The LBC chairman also discussed ways of cooperation through the LBC’s Oil Committee and holding future meetings to establish means of cooperation with the Libyan private sector. He also called on partnerships with foreign companies in various forms, including through PPP and BOT. In turn, NOC chairman Sanalla valued the LBC’s support and its insistence that the NOC remained unified and away from political tug-of-war. He also welcomed the support for increased oil production and the maintenance of oil infrastructure. Sanalla assured his full support for the prioritization of and for private sector Libyan companies in any future projects and partnerships with foreign companies. Finally, it was agreed that an expanded meeting would be held soon between Sanalla and managers of NOC subsidiaries with members of the board of the LBC.